The mission of Hicksville Gardens Civic Association (HGCA) aims to improve the quality of life for the Hicksville community by encouraging community awareness, participation, and civic pride. Thanksgiving is a time when we remember those in our community who are not as fortunate as we are in celebrating a family meal together on Thanksgiving Day. Through Lee Avenue School, we were able to help donate a Thanksgiving meal for three families and fill their cupboards for the Holiday Season. The Community Service committee would like to thank our members for their enormous generosity to our Thanksgiving Food Drive. It was a huge success, enabling us to donate to a third family this year. A special thank you to Foodtown for donating gift certificates for the purchase of a turkey for each family and to T Mobile for donating 2 cases of cereal. 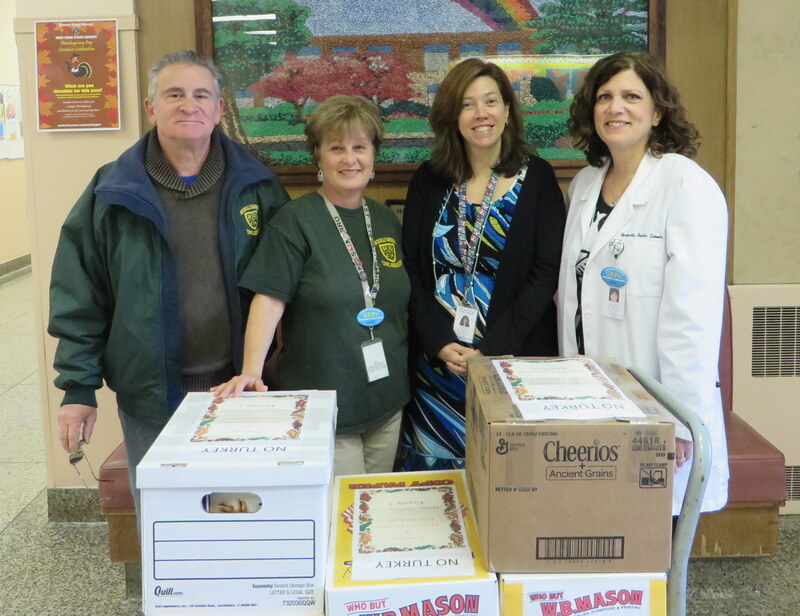 A thank you to Mrs. Stam and Mrs. Kravitz for making us part of this successful food drive. From left to right is the Nicholas Mirro, Christina Mirro co-chair HGCA Community Service, Mrs. Stam, principal of Lee Avenue School, and Mrs. Kravitz, the school nurse. The Community Service Committee would like to thank everyone for their generous donation to our Thanksgiving Food Drive. It was a huge success. We were able to donate 8 boxes of food and Gift Certificates for a turkey to two needy families in our community. We had enough donations for a Thanksgiving meal and to fill their cupboards for several meals! We also would like to thank our commercial supporters Ferreira Foodtown for their generous donation of four $25.00 gift certificates and Hicksville T-Mobile for donating 2 cases of cereal. The Community Service committee would like to thank everyone for their generous donation to our Thanksgiving Food Drive. It was a huge success. We were able to donate 7 boxes of food and a Gift Certificate for a turkey to a needy family in our community. This is done through the Lee Ave. school administration and nurse’s office, which selected an appropriate needy family. We had enough donations for a Thanksgiving meal and to fill their cupboards for several meals. We would also like to thank contributions: Foodtown for donating a gift certificate for the turkey and T-Mobile for a case of cereal.